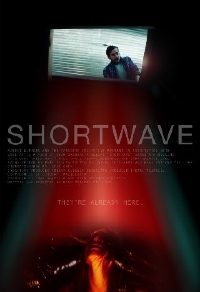 Shortwave is upcoming sci-fi/horror produced by Tony Mancilla and Lindsay Lanzillotta, two of the producers of Sitges winner The Invitation (review). The film is about to begin its festival run with a premier at Dances With Films in Hollywood on Saturday June 4th. In the film, a couple loses their daughter in a peculiar disappearance and is trying to move on. But after moving into a new home, a particular shortwave radio signal brings about oddness. Shortwave is the directorial debut of Ryan Gregory Phillips and stars Juanita Ringeling, Cristobal Tapia Montt, and Kyle Davis and features Jay Ellis, Nina Senicar, Sara Malakul Lane. Josh and Isabel Harris, after suffering the loss of their only child, relocate to a secluded hillside research facility with the hopes of repairing their broken family. After years of trying, Josh and his research partner, Thomas, have a breakthrough involving a cryptic shortwave radio signal and its universal origins. Something within the signal resonates with Isabel and she begins experiencing seeming hallucinations and visions of distant memories. Upon further investigation into the phenomenon, the scientists fear for Isabelâ€™s health while Isabel fears the signal has attracted something sinister to their new home. Word is there will be a teaser soon, so be sure to check back for that!